Three types of information are available here: a voter guide, a political party comparison guide on 10 key issues, and a legal guide on what churches can and can't do. 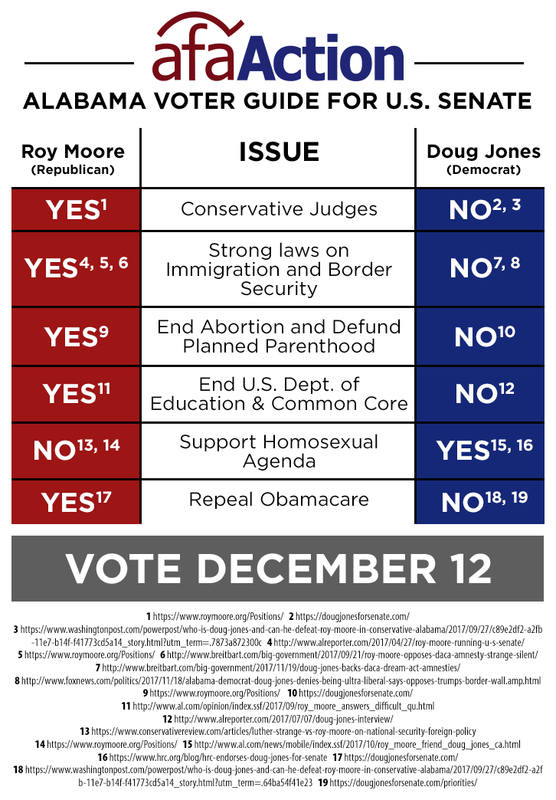 Below is the expanded version of the Alabama voter guide. Click HERE to download a PDF and make copies for distribution in your neighborhood, church, club, or other 501(c)3, non-profit organizations. Click on image below to view a larger image. Doug Jones is a progressive, liberal Democrat who will continue the legacy of Obama and Hillary to put America Last and socialistic/crony corporate interests first. Jones favors abortion until full birth. Meaning he supports partial-birth abortion. Jones does not hide his liberal and socialistic views. Judge Moore has promised to advance and vote for conservative judges, support border security, oppose amnesty for illegal aliens, oppose abortion and vote to defund Planned Parenthood, and oppose the radical anti-Christian homosexual/LGBT agenda. We’re at moment where the constitutionally protected right to religious liberty is imperiled. Christians are being pushed to the margins by the unconstitutional view that Christians must sacrifice their 1st Amendment right to religious expression at the altar of homosexual and LGBT tolerance. Senator Mitch McConnell and the crony corporate and political establishment have been fighting hard to keep Judge Moore from helping President Trump drain the swamp. The political elite absolutely hate the prospect of a constitutional, conservative Christian -- that's not bought-and-paid-for by the political establishment -- going to the U.S. Senate. The special election is Tuesday, December 12. Please vote and encourage your friends and family to vote, too.